For the MJOLNIR armor variant, see ENFORCER-class Mjolnir. Enforcers are large robotic automatons designed by the Forerunners to prevent and suppress massive Flood outbreaks, such as the one that occurred on Delta Halo around 97,000 years prior to 2552. They were only released in the event of severe containment breaches. Enforcers are a specialised Sentinel variant equipped with energy shields and an array of powerful weapons. They serve as part of a Halo installation's defense against mass Flood outbreaks and have been seen guarding key locations such as the entrances to the Sentinel Wall and the Library on Installation 05. Enforcers are produced by hovering Sentinel production facilities. Enforcers have three energy shields; the larger two are split in half (for their pulse beams to fire through), and the small upper shield protects the 'eye' of the Enforcer. However, the shields only protect the front of the machine. Enforcers are armed with pulse beams and missiles. They are also equipped with large claw-like arms which are able to pick up and rip apart most vehicles. The Enforcers have far more devastating weaponry than the lesser Aggressors, being equipped to neutralize large groups of Flood and any vehicles or other matériel that may have fallen under their control. An Enforcer's primary anti-personnel weapons are two pulse beams, which fire red bolts of semi-solid energy that puncture armor and shred through flesh. To take out packs of enemies or armored vehicles, Enforcers are equipped with a launcher that fires explosive projectiles. These missiles can cause devastating damage to infantry and vehicles alike. In the event that all other weapons are disabled, Enforcers will use a last-resort powerful energy beam. This beam is similar to a Sentinel beam, but with increased range and capable of causing greater damage. Enforcers are also capable of using their two mechanical arms as anti-vehicle weapons. When a vehicle moves underneath an Enforcer, it will temporarily cease attacking, descend directly above the vehicle and unfold its claws, revealing a gravity lift powerful enough to lift a Wraith. It then lifts the vehicle up to its claws and crushes it. Enforcers have only been observed on Installation 05 fighting the local Flood infestation on the levels Sacred Icon and Quarantine Zone. They were not seen in Halo: Combat Evolved or Halo 3, most likely because the situations involving the Flood on Installation 04 were not as serious as that on Installation 05 and Installation 00 was not expected to encounter an outbreak to begin with. Two Enforcers engage a Scorpion tank. The Enforcer's energy shields can absorb more damage than a normal Sentinel shield. The shields, which only guard the front area of the machine, are immune to ballistic weapons, such as the battle rifle, shotgun, and SMG. However, they are weak against plasma weapons, and have many similarities to a Kig-yar's shields as they are blue in color and turn red when nearly depleted. Like a Sangheili or Spartan-II, its shield can be taken out with one charged Plasma Pistol shot. The Enforcer is very strong, capable of withstanding even two Scorpion shells or two to three Wraith shots. If the Enforcer is lifting a vehicle off the ground, all occupants should exit the vehicle immediately to avoid being crushed. One disadvantage of the Enforcer is that they cannot detect enemies in cover, which can be used to a player's advantage. If a player moves stealthily enough from one area to another, the Enforcer will continue to fire into the last known area the enemy was located in. After they have lost track of their target, they will quickly lose interest and turn their back on the enemy, giving the player an opportunity to attack from behind. Once the Enforcer has taken enough damage, its shields will drop and it will explode. After exploding, large pieces of the former Enforcer will come crashing to the ground. These pieces can injure or even kill the player if they land on them, making it best to stay away from the Enforcer when it is destroyed. 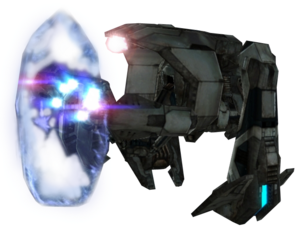 The Enforcer's pulse beams, which appear similar to the Covenant Needlers' projectiles, are usually not a threat to players as they are very easy to dodge. It uses these red projectiles to fight infantry at close- to medium-range. Its mortar projectiles, on the other hand, are extremely dangerous and can quickly pin down or kill infantry. It will use its missiles against any vehicle it encounters, from a Ghost to a Phantom, and will occasionally use it against infantry, should they appear in large groups. The Enforcer uses its mortar projectiles as medium- to long-range weapons. Enforcers also use both their pulse beams and missiles against the player when on foot. They tend to fire their weapons in an order, going from their pulse beams, then to their missiles, then back to the pulse beams. It will continue this until the player is killed or when the Enforcer is destroyed. If the player can shoot off its pulse beam arms, and the small pair of missile launchers on the top of its back, it will start to fire an invisible Sentinel beam. Although invisible, the beam causes visible damage to walls. The sparks emitted from the weapon show that the beam is blue, similar to the beam a Sentinel Major uses. Thereby, you can wield it (it is somewhat hard to do this, so it is not advisable, but, you can try it, making sure not to kill the Enforcer in the process. For close combat, simply leap below it so that it can't position/fire on you. From there, you should shoot off the "legs" on each corner, making it easier to destroy. Finally, simply bombard it with plasma grenades; it should die after two or three on Heroic. For vehicular combat, players should utilize the Scorpion you can easily blast the shielding in front of it off (one shot per half). Then, you can destroy it with one more blast. For Wraiths, repeat, but take gravity into consideration. Spectres just require patience and non-stop shooting to work. In the event you don't have a vehicle, do not stay still. You will be gunned down if you do. Do not drive directly under it to avoid being crushed. It is possible to "surf" these Enforcers, similar to surfing an Aggressor, by jumping on top of it. Note that this is very hard to do. Also, while you are on top of an Enforcer it will not be able to attack the enemies, as it will identify you as the enemy, and focus on you, making the Enforcer useless. The Enforcer's front shields form a visible and viable Marathon style logo. The Enforcer is very similar in appearance to the Retriever Sentinels. Enforcers only appear in Halo 2 in the levels Sacred Icon and Quarantine Zone. Enforcers are not seen on Installation 04 over the course of Halo: Combat Evolved. They may have been present but not deployed because the Flood there were still in the Feral Stage, unlike the Flood on Installation 05 who had managed to construct a Gravemind and therefore reach the Coordinated Stage, the stage when the Flood starts to become truly dangerous. Additionally, it is possible that Enforcers were deployed, but none were present in the areas visited in-game. An angled top-down view of the Enforcer Sentinel. An Enforcer viewed from the side. A rear view of an Enforcer. An Enforcer as seen from below. Frontal view of an Enforcer's fully-charged shields. An Enforcer with its energy shield half-depleted. Note the Marathon symbol formed by the shields. An Enforcer without its energy shield (as seen in the beginning of the level Sacred Icon). An Enforcer firing its pulse beams. An Enforcer engaging a Flood-commandeered Ghost with its missile launcher. Thel 'Vadamee battling an oncoming Enforcer. The front of an Enforcer on Delta Halo, from the Art of Halo. The Enforcer in Halo 2: Anniversary. An Enforcer behind Thel 'Vadamee. An Enforcer on Installation 05. Renders of the Halo 2: Anniversary Enforcer.